Vietnam hopes to learn from Singapore’s experience in the management of environment and water resources as well as environmental quality improvement and green city development, stated President Tran Dai Quang. President Tran Dai Quang (R) welcomes Singaporean Minister of Environment and Water Resources Masagos Zulkifli. Meeting with visiting Singaporean Minister of Environment and Water Resources Masagos Zulkifli in Hanoi on April 24, the State leader underlined that environmental protection is an urgent matter of Vietnam, and the country will not sacrifice its environment at any cost. He revealed that the country will continue boosting socio-economic development towards sustainability with great attention to environmental protection. He also thanked Singapore for sharing its knowledge in national governance, urban management, economic development and personnel training. At the meeting, President Quang affirmed that Vietnam always attaches importance to and spares no efforts to bolster its strategic partnership with Singapore, asserting that the minister’s visit will open up new cooperation prospects between the two countries in the area of natural resources and environment. He held that his visit to Singapore in August last year and the Vietnam tour of Prime Minister Lee Hsien Loong in March this year, as well as other visits of ministries’ leaders have helped tighten the bilateral strategic partnership after four years of existence. The connection and mutual trust between leaders, governments and people of the two countries will be an important motivation lifting the bilateral ties to a new height, he said. President Tran Dai Quang also spoke highly of the economic, trade and investment collaboration between the two countries, noting that Singapore is the sixth largest trade partner and third biggest investor of Vietnam. Singaporean-invested projects are operating effectively, creating jobs for locals and supporting the regional economic transfer in Vietnam, he said, adding that he is pleased with the two countries’ agreement to open the eight Vietnam-Singapore Industrial Park in the central province of Quang Tri and a software technology centre in the central city of Da Nang, which was reached during PM Lee’s visit. He proposed the two countries consider the implementation of new collaboration models such as hi-tech and innovative technology areasand food processing centres in major localities across Vietnam. 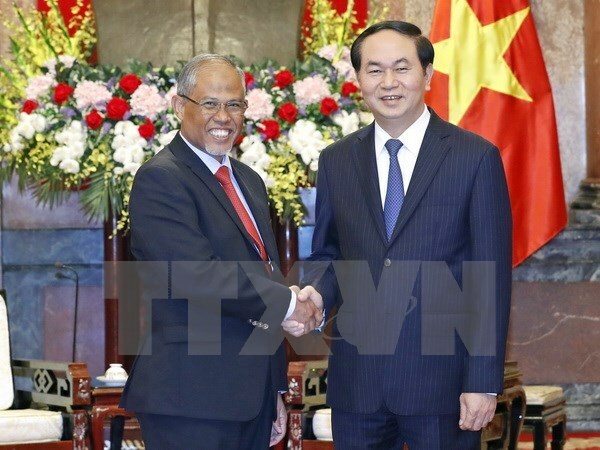 On his part, Masagos Zulkifli said that the high-level visits between the two countries showed the developing bilateral strategic partnership, with the highlight of the effectively operating VSIP system in many Vietnamese localities. He noted that Vietnam is rising strongly and becoming an attractive destination to investors and visitors, including those from Singapore. Sharing his host’ view on the need for environmental protection, he said that environmental pollution not only affects a particular country but also impacts neighbouring ones as well as the whole world. He suggested that Vietnam and ASEAN countries need to show the bloc’s clear stance in the field at the UN conference in Nairobi, Kenya in late 2017. The viewpoints of ASEAN will be discussed at the 14th ASEAN Environmental Ministers’ Meeting in Brunei in September this year.